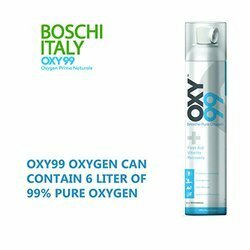 Medical oxygen cylinder comes packaged in small canisters weighing just 100 grams containing 6 liters of oxygen making up around 150 inhalations. It offers ideal solution for raising your oxygen levels in your bloodstream. Oxygen cans come attached with a spray, which is used for inhaling oxygen from the canister. Medical oxygen can is an ideal oxygen supplement used for raising your oxygen levels in your bloodstream. Our portable oxygen cans are used for restoring back to normal in case there is dip in your oxygen blood levels. Oxygen cans come attached with a spray, which is used for inhaling oxygen from the canister. However, it can also be used with a face mask. Patients suffering from respiratory diseases such as COPD, OHS, sleep apnea, hypoxia, hypoxemia, etc, can also meet their oxygen requirement inhaling from the medical oxygen can. Medical oxygen can is used for breathing extra oxygen for restoring oxygen level back to normal in case there is dip in your blood oxygen levels. Drop in oxygen level causes low energy, fatigue, stress and depression. Canned oxygen is ideal if you want to renew your energies, strengthen immunity, enhance physical energy, mental clarity and improve mental functioning. A dip in oxygen will lower your energy level but it can be quickly recovered if you breathe from the medical oxygen can. Disposable oxygen can is the ideal remedy if you are suffering from the negative effects of low oxygen. Human beings are is dependent on oxygen for burning food to release energy and heat which is used for accomplishing daily tasks of life. When the oxygen level falls below the normal levels, you are energy and capacity to accomplish your necessary tasks become limited. After inhaling from the oxygen can, you will feel that energy has been restored in a sudden gush. Having adequate oxygen rushing through your blood, you will be at the top of your game. 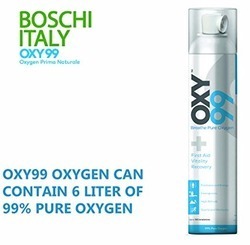 Disposable oxygen can comes packaged in a aesthetically designed canisters which are made of tin which comprise of 6 liters of oxygen that make up 150 inhalations. After breathing from the oxygen can, you will feel the energy coming back which went down with low oxygen level. It is the best remedy if you are looking to improve your energy level, mental fitness, physical stamina besides strengthening your immunity. There are numerous reasons for low oxygen such as pollution and over-crowded conditions in our cities. Our disposable oxygen can presents the best option for countering the negative effects of pollution and increasing oxygen. Usage Medical, Hospital, Clinic, Personal, Sports, Fitness, High Altitude, Freshness. Medical oxygen cylinder is a perfect oxygen supplement which is used for raising your oxygen level in your bloodstream. Medical oxygen cylinder is used for restoring oxygen level back to normal if there is a drop in the oxygen level. 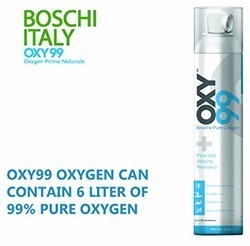 Oxygen cans come equipped with a spray, which is used or oxygen from the canister. Patients suffering from respiratory diseases such as COPD, OHS, sleep apnea, hypoxia, hypoxemia, etc, can get supplemental oxygen by using the medical oxygen cylinder. Medical oxygen cylinder is used by persons afflicted with low oxygen level to raise their oxygen level back to normal levels. Dip in oxygen level causes low energy, fatigue, stress and depression. It is the best option for you in case you want to raise your energies, strengthen immunity and increase physical and mental energy besides improving your mental functioning. A dip in oxygen level in will reduce your performance level but you can recover your energy by using medical oxygen cylinder. Looking for Medical Oxygen Cylinder ?